This started off as a glutinous chinese pumpkin bun stuffed with red bean paste, but the dough was still too sticky, despite having added twice the amount of rice flour stated in the recipe. I knew it was because the moisture content of my pumpkin puree was much higher, but my house was entirely out of glutinous rice flour, and I didn’t feel like making the trip to TNT, nor did I want to compromise the mochi-ness of the bun by adding regular all purpose flour. So I decided to waffle it, which never ends up badly, according to buzzfeed. I also recalled seeing something similar on Mandy’s blog, so I went ahead and plugged in my waffle iron. 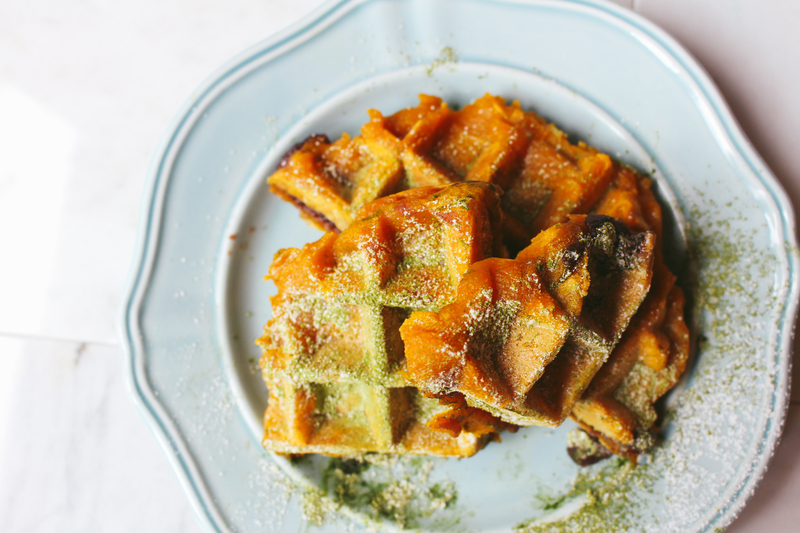 These waffles are also relatively~ “healthy”… no butter or oil, except to grease the iron. No sugar in the mochi, but definitely sugar in the red bean paste. And uhhh, also it’s unintentionally gluten free? Not that I have to justify anything, because these are so darn good. 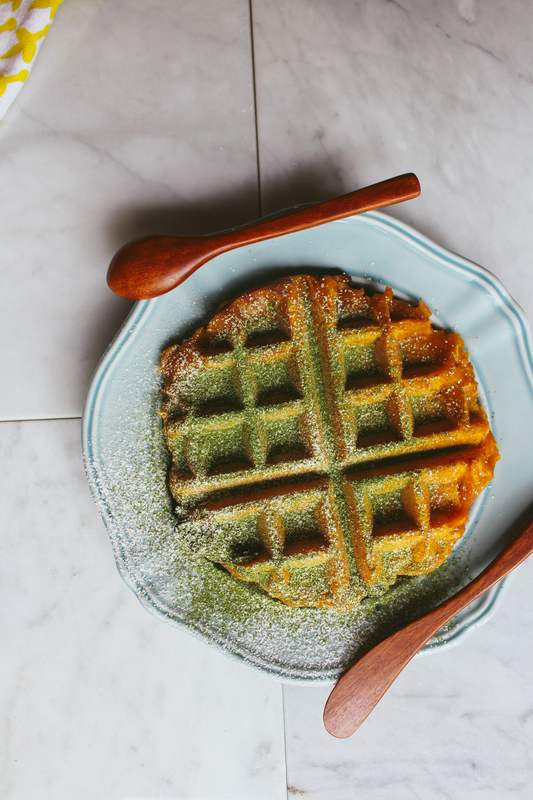 Perfectly crispy, unexpectedly airy (despite not having added any leavening agent, except incorporating air), CHEWY, pumpkin-y, red bean-y, slightly bitter from the matcha powder… epitome of mochi +waffles. If you don’t like red bean paste, of course you could sub in nutella or your favourite nut butter. Ugh, I can imagine these stuffed with chunky apple compote, dusted with cinnamon sugar… the perfect fall treat. In a large mixing bowl, beat together the pumpkin puree and glutinous rice flour until well combined. You’re looking for a pasty-texture, without any streaks of flour. It comes away from the sides of the bowl easily, similar to choux paste. Stir in the vanilla extract, salt, cinnamon and nutmeg. 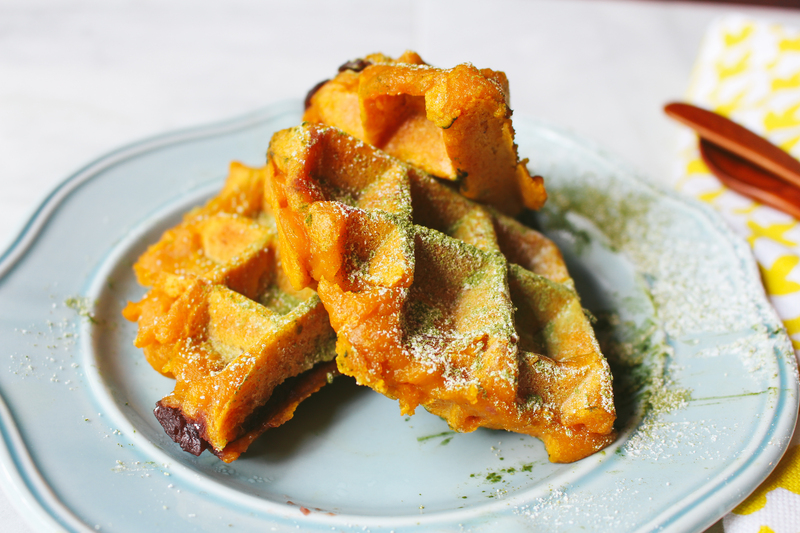 Place about 1/3 cup of pumpkin batter into the centre of your waffle iron. Top with 2 tbsp of red bean paste. Top with 1/4 cup of pumpkin batter, or just enough to cover the red bean paste. Press down the iron, and follow the manufacturer’s instructions as to how long to cook it for. You’ll know it’s ready when it’s golden brown, crispy, and your kitchen smells of happy smells. Mine took about 6 minutes. There’s no fear of overcooking it or anything, so err on the side of overdone rather than under. 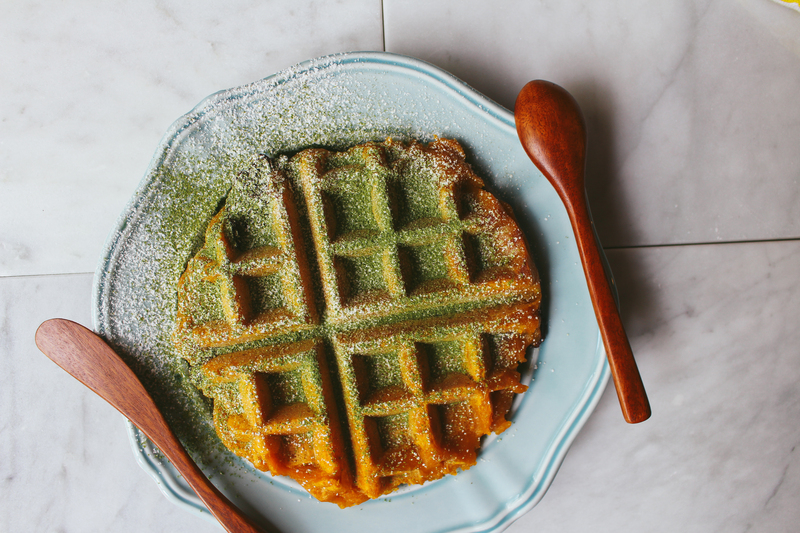 Place the finished waffle on a rack, and dust with a mix of icing sugar + matcha powder if desired. It adds a little sweet bitterness to the waffle. Serve right away, or cool and freeze. They reheat well in the toaster. Be careful not to stack them while warm, otherwise they become soggy. 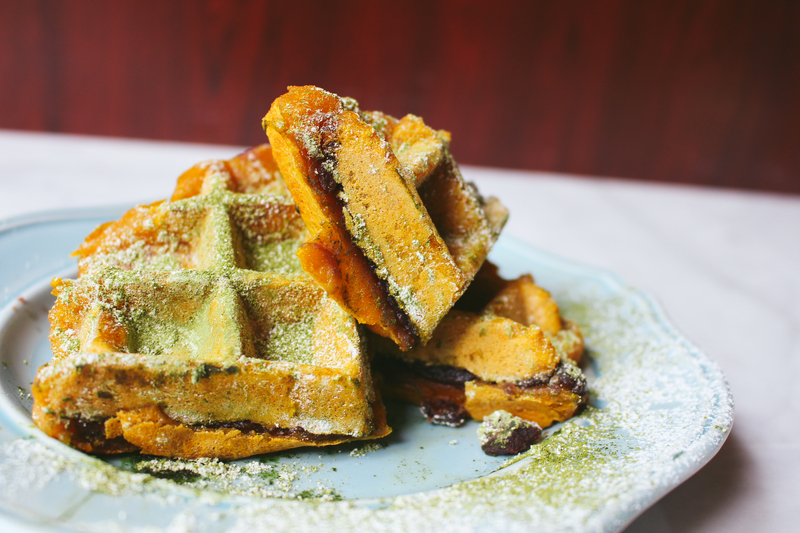 You can even put matcha into the waffle batter if you like.